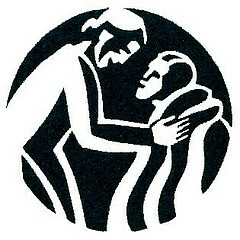 Last week the search terms "ade bethune works of mercy" brought someone to the blog. 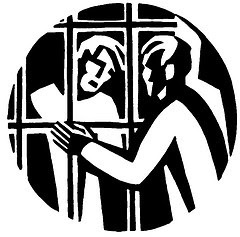 If you subscribe to or know the history of The Catholic Worker you're familiar with Ade Bethune's artwork. In its early years The Catholic Worker paper lacked a good visual aesthetic. 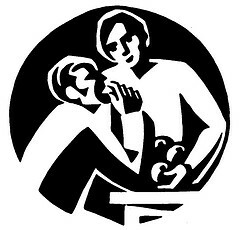 Seeing this, and impressed with the work of Dorothy Day, in 1935 Ade, a 19 year old art student, provided The Catholic Worker some artwork for the paper's banner, Christ embracing two workers, one black and one white. In 1985 Ade updated the banner, replacing one of the men with a woman. Beyond the banner Ade contributed many woodcuts of working saints to the paper, setting the aesthetic look for the paper, one that continues to this day. 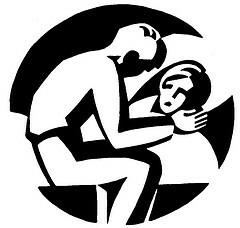 Among my favorites of Ade's work is her series depicting the Works of Mercy. 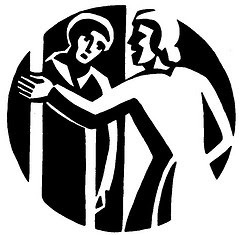 There are six works of mercy listed in Matthew 25.31-46. 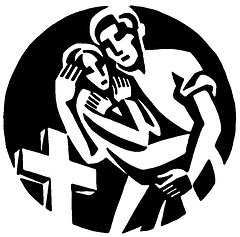 In some series a seventh work--burying the dead--is added based upon Tobit 1.16-17. A post straight to the heart. I am sure many, like myself, will look at these seven works of mercy and ponder the past as to when they were able to carry out these merciful acts, and when they will have the opportunity to do so in the future. Yet, as I think of it, I believe these seven works call upon us and make their demands at different times in different ways. An example. Last weekend, while my wife and I took our seat on a train at Penn Station in New York, a woman walked onto the train, pleading with all, "Please, my son who is fourteen years old has an emergency, and I need money. Is there anyone who can spare anything?!!" In the blink of an eye, people were opening their purses and wallets, taking out bills, not coins, and gently placing them in the mother's hand. As my wife and I handed her what we were giving, I noticed a lady in the seat across the isle take out a twenty dollar bill and give it to the mother with a "God bless". The mother graciously thanked everyone and exited the train. I was truly moved. But it wasn't long before I remembered a Facebook video that "Christians" had recently posted of a woman begging on a street who turned out to be a fraud. The caption said, "This is why I don't give to beggars". But this is what I noticed about the wave of mercy that rolled through that train. In this one train car, the people, obvious by their attire, represented at least three different religions. No one questioned her. 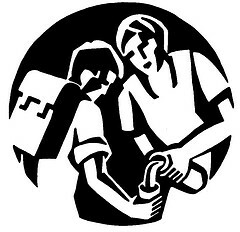 In each heart one or more of the seven works of mercy was carried out. And for all who have made jokes about how unfriendly people are in the Northeast, yes, this was New York City.